It is a serious infection of the lungs arising due to inhalation of gastric contents or secretions of the oropharynx, the part of the pharynx between the soft palate and the epiglottis. Although small amounts of foreign elements often enter the respiratory tract, the aspirated materials stimulate the cough receptors for their removal. In this condition, however, patients are unable to remove the inhaled oropharyngeal or stomach contents. Approximately 5-15% of patients with community-acquired pneumonia develop the disorder. It is more frequent in adults than in children. However, a small percentage of infants may undergo aspiration. Males are more prone to the condition than females. The toxic effects of stomach acids and oral secretions can cause acute inflammation of the lungs. The condition is also called bronchopneumonia in which the walls of the bronchioles undergo intense swelling. This unusual type of lung irritation can lead to acute respiratory distress syndrome, which may prove fatal if ignored. Accumulation of aspirated materials in the lower respiratory tract could reduce the amount of air inhaled due to partial or complete blockage of the breathing passages. Swallowing is a complex neuromuscular action that involves proper working and coordination of tongue, pharynx and epiglottis. The mechanism is automated and begins with the contraction of the upper pharynx. Problems may lie within the pharynx or esophagus that delays the conscious initiation of swallowing, resulting in accidental inhalation of food. In such cases, the condition is called silent aspiration. In this disease, the nerves of the central nervous system undergo progressive degeneration. The disorder can cause alteration of various motor activities in the body, including swallowing. Interference with the transmission of nerves carrying information between the esophagus and the swallowing center in the brain, may unknowingly lead to aspiration of food. The condition is characterized by sudden death of some oxygen-starved brain cells as a consequence of an arterial blockage or rupture, possibly due to a head injury. This form of stroke is a medical emergency as it can cause partial or complete loss of voluntary movements. Normal swallowing and inhaling gets severely affected when the blood clots in an artery near the base of the brain. Acute or chronic inhalation of poisonous chemicals in the form of alcohol or abusing drugs can often lead to significant toxicity of the central nervous system. This, in turn, leads to sudden inhalation of the toxic substances causing pulmonary inflammation. These are generally the complications or adverse effects of a medical treatment. Iatrogenic artifacts are commonly observed after a surgery or administration of drugs. In the former case, complications arise during general anesthesia performed before the operation. The resulting difficulties in swallowing and inhalation cause aspiration of oral secretions. In chemical pneumonia, the pH of the aspirated fluid is normally less than 2.5 and its volume, greater than 0.3 mL/kg of body weight. The effect of acidic contents on the lungs causes an inflammatory cellular reaction due to the release of potent cytokines like tumor necrosis factor (TNF)–alpha and interleukin (IL)–8. The major pathogens involved in bacterial pneumonia colonize the airways and begins to interfere with normal respiration. As the bacteria multiply at an uncontrolled rate, the condition of the lungs aggravates further. Inhalation of gastric acid contents or other foreign matters is also common in dogs and cats. The condition produces similar symptoms, including coughing, fever and weakness in the affected animals. Bacterial pneumonia-affected patients show an elevated white blood cell count as an indicator of infection. An arterial blood gas test is also performed to measure the arterial oxygen tension, carbon dioxide tension, and acidity in the presence of aspirates in lungs. The blood is usually drawn from an artery for accurate measurements. The test is equally helpful in determining the concentrations of lactate, hemoglobin, and several electrolytes. Radiography of the chest can spot the infiltrate formation, specifically in the right middle and lower lobes of the lungs. In fact, patients who aspirate in an upright position tend to have bilateral lower lung infiltrates. Right upper lobe is a common site for infiltrate formation in individuals who regularly consume alcohol. The test detects and identifies bacteria infecting the lungs and airways. Sampling of the infected sputum is normally performed by administering cough-producing irritants to the patients. The sample of sputum is then collected and sent for culturing. In this procedure, the cognitive, voluntary and involuntary behavioral processes are properly examined in order to find out any underlying neurological disorders causing the pulmonary condition. The diagnostic procedure involves ingestion of barium sulfate to examine the condition of the upper gastrointestinal tract. With the help of a fluoroscope, images are taken as the contrast medium is swallowed. If the radioactive element takes longer time to move through the digestive system then a swallowing disorder is most likely to be present. In this medical technique, a bronchoscope is inserted into the airways, normally through the nose or mouth to look for any foreign bodies. It is also helpful in ruling out the presence of a lung tumor. Ultrasonography and CT scan of the chest can detect excess fluid between the two pleural layers as well as pulmonary infiltrates. The imaging test can clearly differentiate lung defects from pleural abnormalities. It is an invasive method in which fluid from the pleural cavity is removed and tested for finding the underlying cause of inflamed lungs. Elevated amounts of white blood cells and platelets indicate pulmonary infection. Community-acquired pathogens such as Pseudomonas aeruginosa that have invaded the lungs need to be eliminated by using clindamycin, or amoxicillin. The role of corticosteroids in the treatment of aspirated lungs is not clear. However, it is required in rare cases. In this technique, a sterile suction machine is used to remove the aspirated materials from the trachea and lower airway that cannot be cleared by coughing. Removal of the stomach contents or oropharygeal secretions from the lungs restores normal breathing. In case of acute respiratory distress syndrome, a ventilator is used to assist in spontaneous breathing. The life-saving intervention pushes air into the trachea to prevent a respiratory collapse. Low levels of oxygen in the blood can have damaging effects on the brain. For this reason, patients must be immediately supplied with oxygen using a mask to relieve respiratory distress. Specialists insert a flexible plastic tube through the chest wall into the pleural cavity to remove the aspirates or fluids. Proper chest drainage is most often used an emergency procedure to prevent the lungs from getting collapsed. 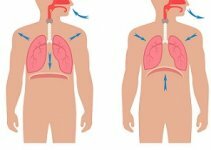 Regular episodes of aspiration may result in long-term inflammation of lungs. Inability to supply oxygen to the vital tissues can cause the infection to spread to the entire body. In a short span of time, patients may experience a septic shock, which could be extremely fatal. Gradual deterioration of pulmonary tissues can place the life of patients at a huge risk. The long-term outlook of patients with chemical or bacterial pneumonia relies on factors like underlying illnesses, health status and associated complications. The severity of the disease and subsequent development of pulmonary complications determines its fatality. Longer period of hospitalization should be avoided to prevent the transmission of nosocomial pneumonia from other patients. Patients with swallowing difficulties need to perform some oral motor exercises. To reduce the risk of aspiration the head of the bed must be positioned at an angle of 30 to 45 degrees. Affected individuals should never eat while lying flat on the back. Such patients must take semi-solid foods and practice eating slowly. While swallowing the chin should be down to prevent the food from entering the lungs. In severe cases, nasogastric feeding is the only option. Proper dental hygiene kills the bacteria residing in the mouth. Sedatives should be avoided as these can dry the mouth. Healthcare professional need to follow certain guidelines specifically designed for the treatment of Aspiration pneumonia. The involvement of microbial pathogens demands sterile clinical settings to prevent the development of secondary infections. Patients who are having problems with swallowing and breathing should consult a doctor quickly and correct the root cause in time. In the absence of prompt treatment, the condition can lead to life-threatening complications.